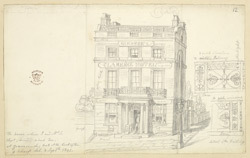 This pencil drawing depicts the Clarence Hotel, a pleasant overnight stop for the Scharfs in 1842. Daniel Defoe was to remark on the area of Gravesend as "the key to the river Thames, and consequently the key to the city of London". During the 19th century the town was home to the rather dangerous pastime of "boat burning", which coincided with Bonfire Night, May-making, New Year and Election celebrations. The process for this involved commandeering an old boat and filling it with anything likely to burn easily. The flaming bulk would then be paraded along the central streets of the town, often causing riotous situations. It took the local police nearly thirty years to find ways of controlling the chaos.